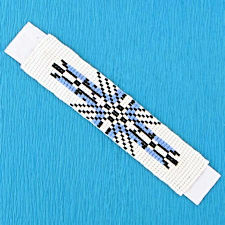 Home » Beadwork » Beaded Patches & Strips » White, Blue, Black Iron On Beadstrip, 1" x 5"
Notify me of updates to White, Blue, Black Iron On Beadstrip, 1" x 5"
White, Blue, Black Iron On Beadstrip, 1" x 5"
Hand beaded seed bead strip. 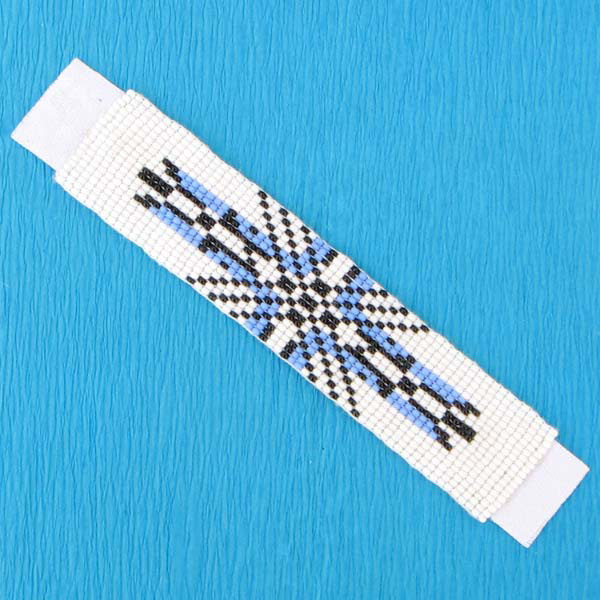 These Southwest Native American style beaded strips measures 1 inch (2.54 cm) by 5 inches (12.7 cm) long. They are done in tiny 11/0 seed beads. This beaded strip is backed with Iron On tape, or it can be sewed, or glued onto material, leather, wood, etc. Use this bead strip on your tribal regalia, a coat, purses, shoes, hat, guitar straps, horse bridles and dog collars, etc, for an easy and beautiful decoration.